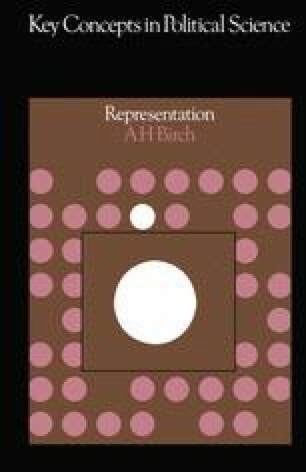 Normative theories of representation have nearly all been formulated to serve practical purposes, such as the justification of existing institutions or the promotion of political reforms. Most of the theories so far discussed emerged out of the debates on the American and French revolutions and the protracted discussions on the reform of Parliament and the extension of the franchise in Britain. The main political developments of the twentieth century—the growth of party discipline, the extension of government activities, the rise of one-party states and totalitarian systems, the emergence of the new states of the third world, the spread of violence—have given rise to a variety of theoretical writings but not to new theories of representation, with the one exception of the theory of responsible party government considered in the previous chapter. Because of this, the functions of political representation are normally discussed in a language which is slightly dated in character and tends to reflect the values of nineteenth-century liberalism. To overcome these limitations it is necessary for the student to disengage himself from the assumptions of liberal democracy and consider the issues in a broader perspective and a more analytical manner.